Be the Beacon of Love and Light by Being Authentically YOU! Brittany Blomsterberg, MA is a Spiritual Life Coach, Reiki II Practitioner, and a Yoga instructor. 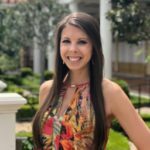 Her journey began with over ten years of formal education in Psychology resulting in a Master’s Degree in Marriage and Family Therapy, a transition as a therapist to a Results Coach for Tony Robbins, and continues with her evolution of fully embracing a mind-body-spirit approach to serve others. Brittany became enamored with all forms of spirituality in the midst of her Master’s program. She pursued her own study of sacred texts, immersed herself during a month-long trip to Thailand, and attained extensive education on the energetic chakras. She has since become a certified Reiki practitioner and a registered yoga teacher. Brittany loves connecting with her tribe, being in the flow, dancing, nature, raising the vibe, smiling, music, being playful, traveling, reading, metaphysical conversations, adventure, and forever being a student of an epic life! Brittany is certified in the following: RYT-200, BUTI Yoga, Hot BUTI Yoga, Reiki I & II. She is affiliated with Yoga Alliance, the International Association of Reiki Professionals, and BUTI Yoga. Brittany supports Torrance Memorial Hospital Hospice Care by providing Reiki to hospice patients and their families. During season, Brittany is an assistant coach for the flag football division of the Southern California Special Olympics.